Version 1.0 includes over 350 useful words and phrases covering a range of categories including Greetings, Farewells, Introductions, Common Expressions, Thanks, Asking for Directions, Adverbial Prepositions, Common Restaurant Phrases, Ordering Food, Common Food and Beverages, Describing Paintings, Colors and Checking into a Hotel. Professionally produced audio with native Latin American accents and real-time facial animation, so you can hear and see how it’s done firsthand. A Quiz Mode where you can test your knowledge against what you’ve learned. 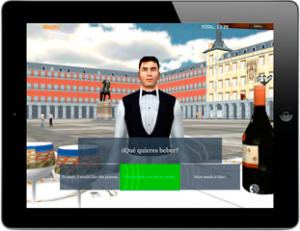 Also included is a Dialog Mode where you can practice your conversation skills while meeting someone out on the plaza, ordering lunch at a café, asking for directions and checking into a hotel. This is our first version! So if we got something wrong, if you have ideas and suggestions for how to make PlazaLingua better, or requests for new content, let us know.